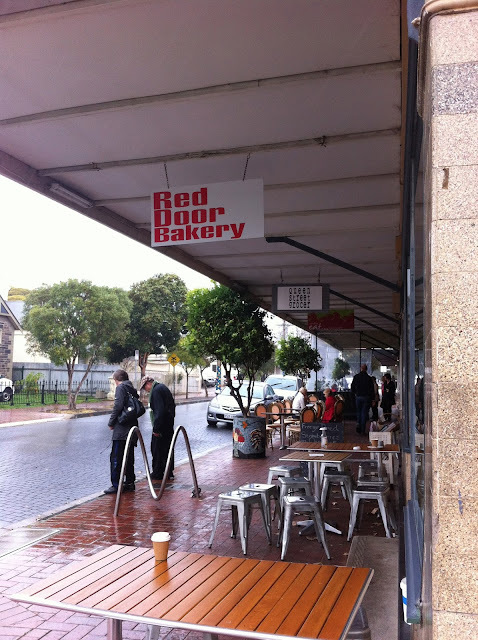 Today, I paid a very brief visit to the Red Door Bakery. It was pouring outside and very packed inside! This was my second visit and I already had in mind what I wanted to try; a salted caramel brick. My sister's friend knows I love salted caramel and recommended that I try one the next time I visit. I ended up picking these up for myself and my family. I would probably describe this as a rich, decadent, chocolate-y brownie filled with delicious salted caramel, topped with a layer of chocolate and sprinkled with salt. I love the fact that the salted caramel is perfectly salty, and that it oozes out of the 'brick' once you take a bite. Everything just works so well together, and I definitely recommend you give it a go if you're a salted caramel fanatic like myself! This is definitely a place worth the hype, and if you've been needing a bit of a nudge to go and visit, this is it! I still need to try more of their goodies, but what I've had already has been delicious. I know for sure that I'll have to visit some time for a coffee. The people who work there are always really lovely, too!